OMG Posters! 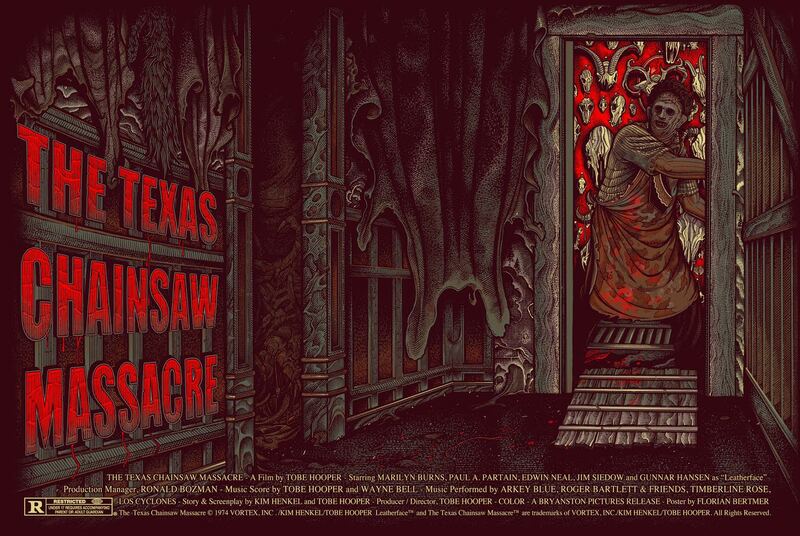 » Archive The Texas Chainsaw Massacre Poster by Florian Bertmer (Onsale Info) - OMG Posters! Grey Matter Art will launch a brand new series of posters for The Texas Chainsaw Massacre next week, led by this gruesome slab of ink-covered paper by Florian Bertmer. It’s a 24″ x 36″ screenprint, has an edition of 200, and will cost $50. The variant has an edition of 125 and will cost $60. In addition, they’ll be selling a four-print TCM subscription with additional posters coming from Jason Edmiston, Gabz, and Francesco Francavilla. Regular subs will be $175, variant subs (include four regulars, four variants, and one foil poster by Gabz) will be $420. Everything goes up Tuesday, November 25th between 1pm-2pm Eastern Time. Visti GreyMatterArt.com. It seems cool to me. Thanks to Grey Matter Art fro lancing series of posters for The Texas Chainsaw Massacre. I’m also waiting anxiously for this.